Keyword research is the door for success in online, if you open the wrong door then you will end up in a dead end after losing a huge amount of money. Secondly we will brain storm about your keywords and try our level best to sort out the highest possible 5 legendary keywords through which you will rock with your site to grab Golden Eggs. Report will be in excel file consisting of 2 sheets. In the 1st sheet you will get 5 legendary keywords and Average CPC, Local Searches, Global Searches, Keyword Competition (KC) Score which declares your ranking difficulty. 2. In our Local Searches report you will get the search per month in USA. But you can also mention your desired country where you want to check the Local Search. 4. 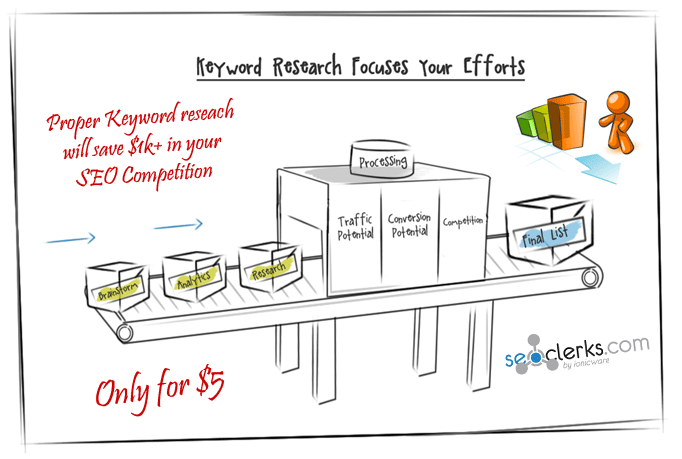 Keyword competition is an Ultra important matter for your SEO budget. No worries, we will select those keywords which cut your SEO budget to your affordable range. In the 2nd sheet you will get Competitor URL, Page Authority and Moz Rank of your top 10 Competitor research for each 5 keywords. Now, you might have question arising in your mind that why ranking but why not 1st page. Ranking in the search engines are cool but even I also hardly check the 2nd page of Google in my search. Then how to get in the 1st page in 1st place. Main concern is traffic not ranking from nowhere to 58th position. I agree with you. Only for this reason, we are bringing our monthly package to everyone’s door under the sky to rank in the 1st page in SeoClerks. For update please check our profile page regularly. do deep SEO Keyword Research for your Niche or website is ranked 5 out of 5. Based on 39 user reviews.